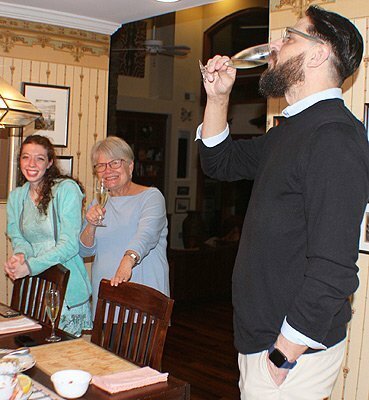 If you want to celebrate with real Champagne, but don’t want to spend the money on the French import, you can always choose an American cousin with French roots. 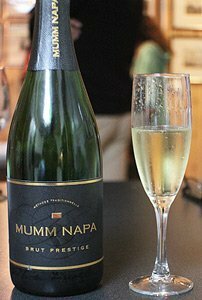 Mumm Napa Brut Prestige ($23-25) is made the same way as French Champagne, with the same grapes and what is called the methode traditionnelle. It just happens to be made with grapes grown in California. Forty years ago French Champagne house G.H. Mumm dispatched an explorer to the new world to find the ideal spot to grow the grapes they use in Champagne. 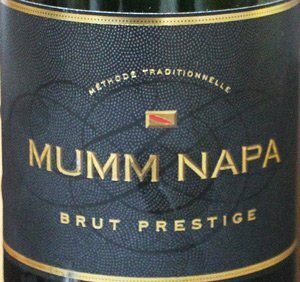 That emissary found Napa Valley and by 1983 Mumm Napa had its first vintage sold under the name Domaine Mumm. The winery has added several versions of its sparkling wine, but the signature wine is the Brut Prestige. In the glass it is a pale gold, with a never-ending string of tiny bubbles. You are greeted with aromas of stone fruit, vanilla, toast and bright citrus. Vibrant flavors of citrus, pear and green apple are balanced by crisp acidity and a lingering aftertaste. It is a relaxed, but elegant, wine that makes every occasion special. It is an ideal palate cleanser, and certainly a mood lifter. The blend is 45 percent chardonnay, 45 percent pinot noir and 10 percent pinot gris/pinot meunier. 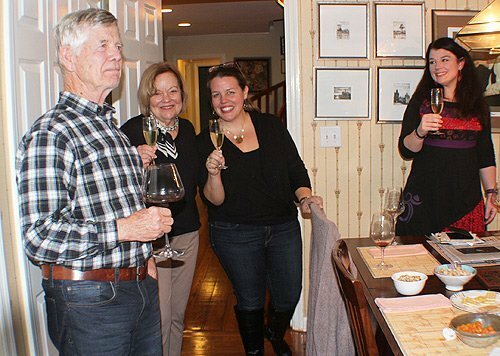 We also celebrated Thanksgiving with a bottle of Mumm Napa Blanc de Blancs ($24), which is made of 90 percent chardonnay and 10 percent pinot gris. It was slightly drier, but still full of citrus, peach and brioche flavors. It was an outstanding wine. The growers have to be careful so the grapes don’t get too ripe. California is warmer than the Champagne region and overripe grapes make lousy sparkling wine. So the vines are planted in cooler parts of Napa Valley and harvested early. Brut Prestige is made from grapes selected from up to 50 locations. The grapes are hand-picked during cool morning hours and brought quickly to the winery for gentle pressing. Most of the grapes are fermented at cool temperatures in stainless steel tanks to preserve freshness and fruit intensity. A few lots are aged in French oak barrels to add depth, complexity and spiciness. Sparkling wine lightens everyone’s spirits. The blend is crafted after initial fermentation to find the perfect combination to match the house style, which is consistent year after year. The blended wine spends an average of 18 months aging in the bottle to add complexity, subtle dough flavors and layers of creaminess. This is also were the bubbles come in. The methode traditionnelle includes 13 steps before the wine lands in your glass from picking the right vineyard site, to assembling the blend to riddling (rotating and tilting the bottles in slight increments) to cellar aging. It is a time- and labor-intensive process, but the finished product is worth it. After 18 months of bottle aging the sediment is disgorged and a small amount of sugar and reserve wine is added back in to fill the bottle, and it is aged another three months. When you pop the cork of your sparkling wine, always keep your hand over the cork as you remove the wire cage to prevent it from flying across the room. I usually put a cloth over the top as an added precaution. 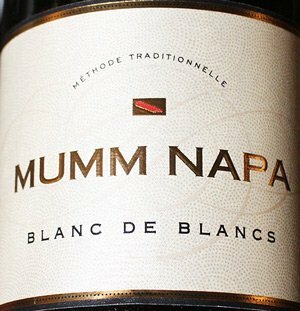 Winery: G.H.Mumm began in 1827 when Jacobus, Gottlieb and Philipp Mumm established their Champagne house in Rheims, France. The company added its famous red sash on the neck of its bottle, in homage to the highest of French honors, the Ordre Royale et Militaire Saint Louis. The sash still appears on labels of Mumm Napa in recognition of their French heritage. In 1976 Guy Devaux was sent to the United States by G.H. Mumm to find the ideal spot to produce sparkling wine. Devaux, founding president and winemaker of Mumm Napa, chose the Napa Valley by 1979. In 1983 he released his first vintage. Three years later Devaux worked with local architects to design a winery building to take advantage of the natural hillside in Rutherford. Two stories of the building are below ground, making for cool cave-like conditions in the cellars. The winery has earned Napa Green certification. The name changed from Domaine Mumm to Mumm Napa in 1990, and the winery was opened to the public. A gorgeous fine arts photography gallery was created at the winery in 1993. It still features inspired photography and includes an Ansel Adams collection loaned to Mumm Napa by Matthew Adams, the grandson of Ansel. In 2002 Champagne-born Ludovic Dervin followed in the footsteps of Devaux, moving from G.H. Mumm to become Mumm Napa’s head winemaker. Dervin and rock guitar legend Carlos Santana collaborated on a sparkling wine expressing their passion and creativity in 2005. Since then they have raised more than $500,000 for the Milagro Foundation, founded by Santana and his family to support vulnerable children and youth in the areas of arts, education and health. The winery also has a partnership with the San Francisco Giants, who celebrated their 2010 and 2012 World Series victories with Mumm Napa. The winery produces a wide variety of sparkling wines, vintage and non-vintage, including several rosé versions, with prices ranging from $24 to $125. It also produces some still wines, primarily chardonnay and pinot noir. Russ, Mary Jo, Andrea and Erin enjoyed the wine. Goes with: We had this beautiful bubbly with stir-fry chicken when we had a houseful of family. 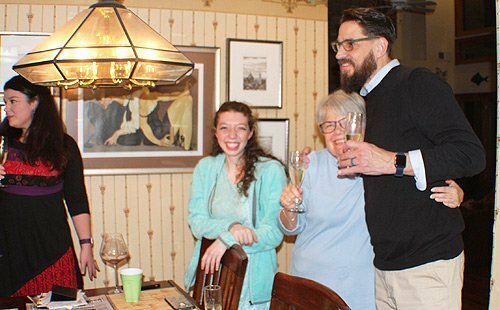 Teri’s sister Mary Jo and her husband Russ came to visit a few weeks ago and we wanted to drink something special. Russ and I love hearty red wines and we had a few of those while they were here, but we also wanted to celebrate in style. One of the reasons they were in town was the daughter of Teri and Mary Jo’s cousin was singing at the Jessye Norman School of the Arts benefit concert. If you missed the concert, you missed a special afternoon. Andrea has a fantastic voice, as did the other singers. With the singers, pianists and dancers, the performance was one of the highlights of the fall season for me. I chose the stir-fry because we wanted time to talk to everyone. So I chopped up all the stir-fry ingredients and had time to talk to everyone while we cooked. The Mumm Napa was wonderful as an aperitif as we toasted our good fortune of being together, but it was even better with the food. The sparkles and bright citrus were a great match for the spicy stir-fry. This sparkler would pair well with just about anything, from light seafood and poultry dishes to vegetarian. It will elevate your meal to a special occasion. The Blanc de Blancs was perfect at Thanksgiving.